Robert Louis Stevenson, The Amateur Emigrant ed. by Julia Reid, The New Edinburgh Edition of the Works of Robert Louis Stevenson (Edinburgh: Edinburgh University Press, 2018). Published May 2018. £80 (and for around £65 from booksellers associated with Amazon). 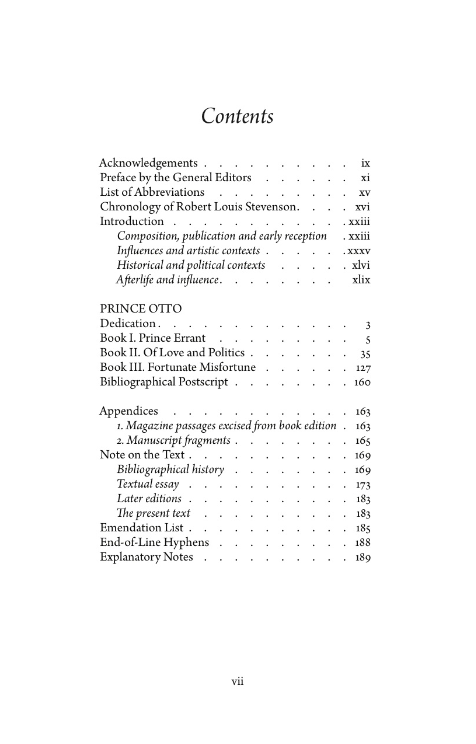 I thought I would gather here the ten postings on Facebook I made in 2014 on the publication of Prince Otto in the New Edinburgh Edition. (Next week I will post information about the latest publication: The Amateur Emigrant). Enjoy! The hour, the season, and the scene, all were in delicate accordance. The air was full of birds of passage, steering westward and northward over Grunewald, an army of specks to the up-looking eye. The accordance is ‘delicate’, like the words themselves that form structures and then pass—I think of the ephemerality of things. The next sentence, shows how a single sentence can take things apart and keep them together: I am aware of the global movement of birds passing over a map-like country, a mere human institution, and then from this perspective near that of the birds, we move to an individual standing on the ground, myself perhaps, looking up and seeing them as distant, fleeting. Such sentences seem so easy to write—they are syntactically simple—yet clearly the work of great ability and are, I say it again, a pleasure to read. Holding his feet, he stared out of a drowsy trance, wondering, admiring, musing, losing his way among uncertain thoughts. Otto is sitting on a rock in the middle of a stream, that’s why he’s holding his feet—a nice reminder of the centrality of the body; and I recognise that state of losing my way among uncertain thoughts. At a quarter before six on the following morning Doctor Gotthold was already at his desk in the library; and with a small cup of black coffee at his elbow, and an eye occasionally wandering to the busts and the long array of many-coloured books, was quietly reviewing the labours of the day before. — this is a brilliant presentation of a character without the need for the descriptive paragraph (Stevenson never uses this conventional device). We learn by indirect means that Gotthold is an diligent employee of the Palace, an early riser, an orderly person, someone who savours simple pleasures, is of a contemplative nature, and perhaps more. — And what about that wonderful aside ‘and an eye occasionally wandering to the busts and the long array of multi-coloured books’, which concisely sketches in the Library (which I immediately imagine as a long room, a pleasant space, with a planned rather than an accumulated decor) and also gives us an idea of Gotthold’s contemplative nature, his present good humour, his habit of appreciating the world around him, and the relaxed rhythm of his careful work. ‘If you come to think of it,’ said Otto, ‘I am not a popular sovereign.’ And with a look he changed his statement to a question. —Otto is talking to his cousin Gotthold in the Library. The second sentence is very simple, but how could you say it better? At the same time, it effortlessly tells you much about the intimate understanding between the two men. ‘It is very strange, Herr Cancellarius, that you should so persistently avoid my questions,’ said the Prince. ‘You tempt me to suppose a purpose in your dulness. I have asked you whether all was quiet; do me the pleasure to reply.’ […] The Prince waited, drawing his handkerchief quietly through his fingers. —I chose ‘The Prince waited…’, not because it is particularly well-formed, but because it is a good example of Otto’s amusingly camp behaviour. This is a text full of references to the theatre and Otto is a master of style, with perfect manners, an artist with words (as the waspish first sentence shows) (the attention to style and form is a central part of camp humour) and also behaves in a stagey manner, putting on a humorously exaggerated performance. Drawing a handkerchief slowly (but I like ‘quietly’) through the fingers must have been a well-known piece of stage ‘business’. I could imagine the part being played by Rowan Atkinson or Donald Sinden. The council waved like a sea. There were various outcries. For me this is from the most enjoyable chapter: Book 2, chapter 7 (is it part of the joke that the three ‘books’ are a mere 35, 90 and 35 pages? )—Otto’s confrontation with the Privy Council, summoned by Baron Gondremark (in alliance with the Princess) to declare war without telling Otto. These two short sentences come just before Otto’s entrance, after Gotthold has unexpectedly objected to the measure being passed unread and undiscussed: as a result, the council is set in commotion and ‘there were various outcries’. The contrast between the metaphor of the sea and the stark annotation of ‘various outcries’, between the regular rhythm of the first sentence and the awkward rhythm of the second, suggests the confusion, the discord created, and the disconnected nature of the cries. On the stage this chapter would undoubtedly be the end of Act 1. And look how it ends: “And he bowed and left the apartment, followed by Greisengesang and the secretaries, just at the moment when the Princess’s ladies, summoned in all haste, entered by another door to help her forth.” A typical moment for “Curtain”. I think Stevenson is all the time encouraging us to see the story as a play. So without more delay, the Prince leading, the pair proceeded down through the echoing stairway of the tower, and out through the grating, into the ample air and sunshine of the morning, and among the terraces and flower-beds of the garden. —OK, this is an easy construction that anyone can write: the sentence with expanding phrases that corresponds to an expansion of spirit or space. In Shakespeare’s Sonnet 29 we have: ‘Haply I think on thee, and then my state, / Like to the lark at break of day arising / From sullen earth, sings hymns at heaven’s gate’ where the enjambement and unexpected expansion of ‘at break of day arising–From sullen earth’ corresponds to an expansion of both space and spirit. 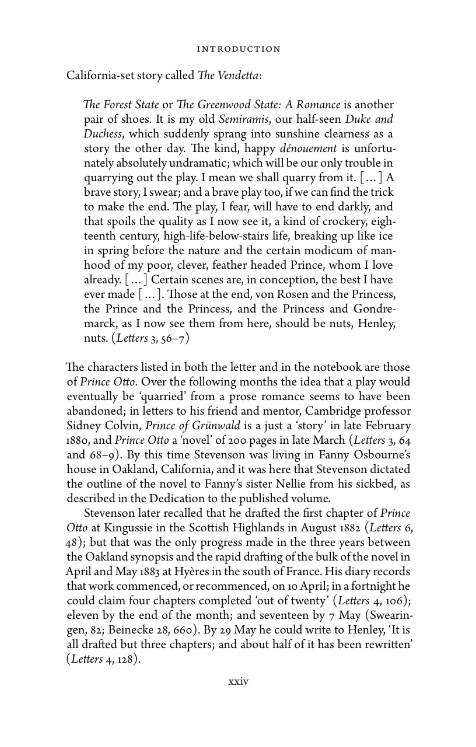 The same here: (after the admirable concision of ‘the Prince leading’) we get the short phrases and transitional movement of ‘down through… out through’ (the grating is probably a small iron-bar gate), and then the paired ‘ample air and sunshine of the morning’ (in airy contrast—in meaning and in the assonance of ‘ample air’— with the material ‘stairway’ and ‘grating’) and then the unexpected addition of another pair of nouns: ‘the terraces and flower beds of the garden’. I said anyone can write this: just string together ‘and… and… and… and’ and if you’re skillful you evoke your epiphany. 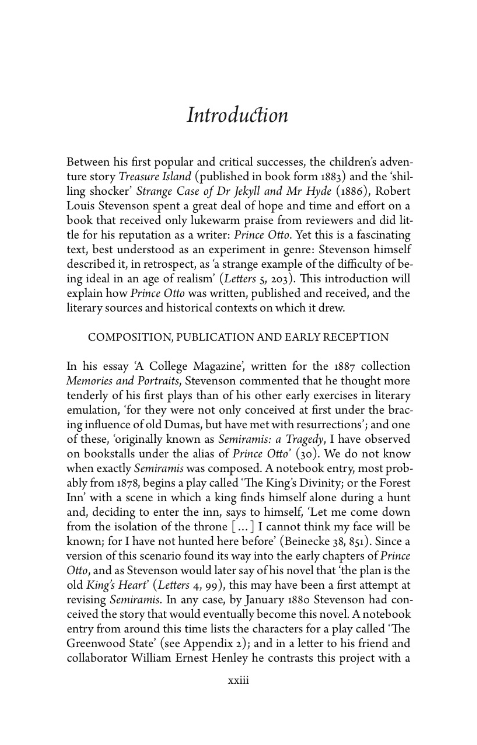 Notice, however that Stevenson has a balanced pair of pairs, not a romantic or impressionistic potentially endless list, so we also have that feel of orderly, controlled eighteenth-century prose as well (only too appropriate for the orderly formal gardens that we can imagine). Just sit back and relax: Stevenson knows how to drive. A shaving of new moon had lately arisen; but it was still too small and too low down in heaven to contend with the immense host of lesser luminaries; and the rough face of the earth was drenched with starlight. Down one of the alleys, which widened as it receded, he could see a part of the lamplit terrace where a sentry silently paced, and beyond that a corner of the town with interlacing street-lights. — Otto is waiting for the Countess von Rosen in the palace gardens. Saying two stressed syllables together requires more than usual muscular effort and so slows you down, that’s why I think ‘i-MMENSE HOST’ sounds so appropriate (slow, effortful enunciation is mapped onto a meaning of large size and difficulty of ‘comprehension’); then we get contrasting quick unstressed syllables of ‘LESS-er LUM-i-nar-ies’. The ‘rough’ earth has all its irregularities brought out by the light and shade, and is ‘drenched in starlight’—full of darkness and small, faint patches of light: so that the trees and bushes are like the sky above. And then we have the brilliant ‘tracking shot’ with that fascinating alley ‘which widened as it receded’ (an effect that language can make us imagine, but would be difficult to make clear on the screen), a section of terrace (one imagines: between the silhouette of two groups of trees) and the sentry’s movement on a path at 90° to our axis of vision, and beyond that the glimpse of the interlacing street-lights of the town beyond, which remind us, in their distance and and small size, once again of the stars. The day drew its first long breath, steady and chill; and for leagues around the woods sighed and shivered. —this from the flight of the Princess in the woods in Book III chapter 1 which has sometimes been printed by itself as a virtuoso piee of writing, so any number of sentences cold have been chosen. The first half of the sentence presents a universe both personified and also independent of human concerns in the ‘steady and chill’ dawn wind. 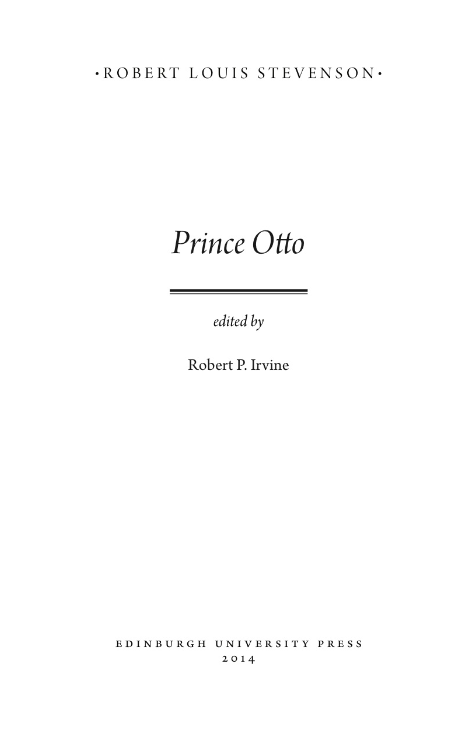 One of the genres that Prince Otto plays with is the eighteenth-century philosophical novel with its structure of chance meetings and conversations with a variety of people (and is reminiscent of S’s own short stories with debates –‘Markheim’, ‘Villon’ and ‘The Sire de Malétroit’s Door’). Perhaps the most illuminating of the resultant ideas is this surprising psychological insight from Gotthold in conversation with Otto in the coach taking them to their Felsenburg prison. But for playfulness, the last two pages of ‘Bibliographical Postscript’ can’t be beaten: the following years of Otto and Serafina are summed up in precise bibliographical references, actual publishers and booksellers, quotations from books by and about them—all amusingly and skillfully convincing until the very last sentence, which reveals the artifice by references to ‘Buttonhole’, ‘Lord Protocol’ and ‘Admiral Yardarm’.